Press Section is one of the most crucial element of paper machine. It is mainly used for dewatering, improving paper performance & conveying paper. 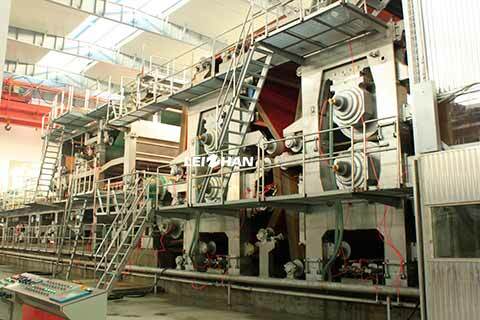 The press section of double wire cultural paper machine adopts main press 1 set, frame adopts steel profile box welding and casting box body, pneumatic &pressurizing, felt water squeezing device, adopts pneumatic correction & electric tension. Ⅲ. Main press upper roll Φ500×1950,Natural granite roller , is equipped with scraper. Ⅳ. Felt leading roll is fully equipped according to the drawing. Ⅴ. Stretch roll Φ170×2000mm, seamless steel tube with coat.